Using flowers to make words is a fun way to create a colorful display that is uniquely yours. Writing with bedding plants is a technique often used to display a company name or logo, or to denote the name of a park or public event. However, you can easily learn how to plant flowers to spell out words in your own garden. Read more about forming words with plants. 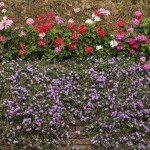 Using flowers to make words involves planting colorful flowering plants, usually annuals, close together so that they resemble a carpet – which is why this method of planting may also be referred to as carpet bedding. Forming words with plants works best if you have a fairly large space too. This allows you the room to spell out a word, like a name, or even to create interesting shapes or geometric designs. Plan your design on a piece of graph paper. Loosen the soil and dig in compost or manure if the soil is poor. Rake out rocks, then smooth the soil with the back of your rake. Mark the letters with sand or spray chalk, or outline the letters with stakes. That’s it! Now that you know how to create your own carpet bedding design, get started and put your garden plants into words.